Love collection is perhaps one of the most iconic collections by Cartier. I have been wanting a piece for the longest time so here we are. Love ring is also available in yellow gold, rose gold, platinum, and set with diamonds in place the the screw motif. Now that I have the ring, I am even more obsessed with the Love bracelet. Cartier Love bracelet was created in the 1970’s by the late Aldo Cipullo, whose early work for Cartier focused on modern interpretations of ancient designs and legends. The Love Bracelet was his interpretation of the Chastity Belt, a medieval device husbands locked around their wives’ waists to ensure fidelity while the men were away at war or business. When I was in Europe I saw chastity devices for both men and women and they were quite interesting but disturbing at the same time. Cartier Love Bracelet is a two piece bracelet that bolts together around the wrist. It comes with a tiny screwdriver to take it on and off, symbolizing a "locked up," committed relationship. Cartier loved the bracelet and implemented a policy: customers could not buy a Love Bracelet for themselves. I know it is not completely true as savvy gal pal has purchased one for herself since she loves herself the most. The company presented his-and-hers bracelets to 25 famous couples: Elizabeth Taylor and Richard Burton, Cary Grant and Dyan Cannon, Ali McGraw and Steve McQueen, Sophia Loren and Carlo Ponti, the Duke and Duchess of Windsor, etc. This new version of bracelet which is called Cartier Free Love allows the freedom to move while retaining the aura and symbolism of the LOVE collection. Its oversize dimensions impart extraordinary expressive power. 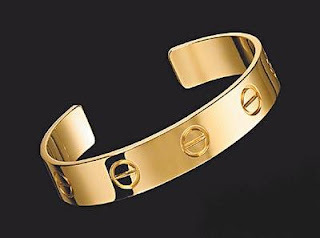 This version of Cartier Free Love wide band cuff bracelet retails for a little over $5000. You lucky girl, it's gorgeous! Oohh.. I am insanely crazy about Cartier Love bracelet.